Local Inspiration: You say tomato, I say…. We’re celebrating hidden home food producers! We’re trying something new with our Bee Sustainable general newsletters: each season, we’ll share a story of the backyard preserving, producing that’s happening all around us. You’ll see what folks are making at home, how they’re doing it and why they love it. Then we post that here, on The Buzz. We’re calling these ‘stories about food communities’ and they’re all around us; people making their own food and finding ways to connect with and be a part of where our food comes from. It’s why we exist and what we’re inspired by. It’s only taken six years for Gavin Ashley and his friends to perfect the process for their annual Tomato Sauce Day. But by 2016, they reckon they’ve nailed it. 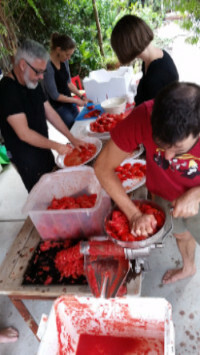 Back in 2010, Gav and his mates got together to make tomato sauce (actually sugo di pomodoro). Armed with 40 kilos of tomatoes and some Google research, they juiced, boiled and bottled late into the night. The results weren’t bad but it was a messy, laborious affair. Still, they’d had a great time and were determined to try again the following summer. Over the years, they refined operations; they sought advice from their Italian neighbours, acquired a manual tomato press, invested in a pot that a small child could hide in and relocated outdoors, to make the idea of hosting a bit more attractive! And that’s what their story is about – creating their own version of an Italian food tradition, producing something delicious over good conversation, in great company. The production line…chop, squeeze, juice. We thought you might like a recipe to help get you started, but there are many different methods and a variety of equipment you can use, depending on how you want to do it. So we suggest that you look here for a list of step-by-step guides produced byCeres Fair Food for their Crowdsaucing event. These guides will help you transform your tomatoes into a memorable sugo di pomodoro! 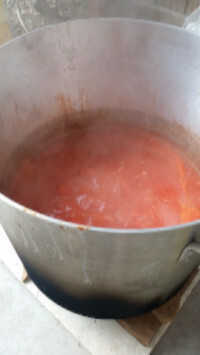 And while you’re there, you should check out what Crowdsaucing is all about; a terrific initiative to encourage people to get together, bulk purchase locally-grown organic tomatoes directly from a grower then make their own tomato sauce over a selected weekend. The 2016 event has been held for this year, but we wanted to share it with you anyway so that you can look out for next year. And you’ll find a tomato sauce-making method to suit you! If you have no experience in preserving, fermenting, baking or bottling,but arecurious about making a closer connection with your food, never fear! 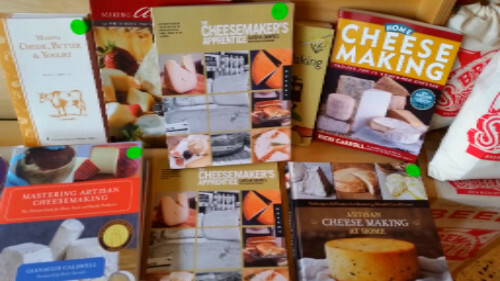 We have a large range of carefully selected books to guide you through all aspects of home food production. From sauerkraut to soft cheese, come and browse our selection or head to our online shop to view our range. Google? Pah; we love a good book to learn from! It’s a creative, joyful thing to take time make food together, even if you don’t have aspirations to make all your food from scratch. If we don’t stock it, we can help you find it. And we love a chat, so we’re very happy to talk over your ideas and answer any questions you might have. At Bee Sustainable, we’re in business to help create more stories like this! Rob and the Bee Sustainable team.